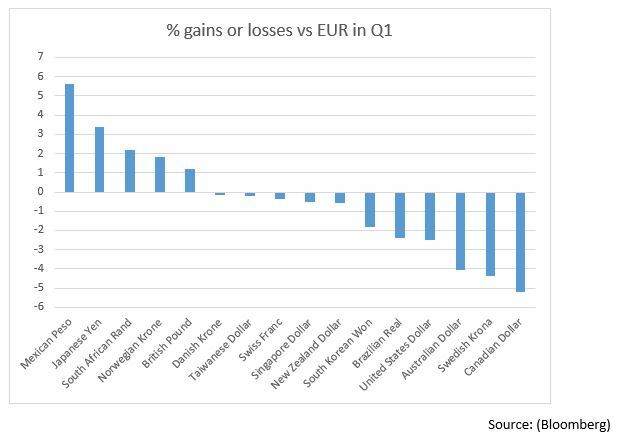 The euro was a middle of the table performer in the first three months of the year, falling against the pound, yen and Mexican peso but gaining against the Swiss franc and the US dollar. Here are three things that will govern the movement of the euro over the next three months. What now for inflation and prices? We are getting to a place wherein we can start talking about the European Central Bank raising interest rates in the next year or so following a decision to halt its quantitative easing program at its August meeting this year. The only thing that will move this expectation from a chance to a certainty is inflation. We are not talking about inflation beating the European Central Bank’s target of 2% anytime soon but a move towards 1.5% over the course of this year and in particular in the next few months should be enough to give the EUR a backbone as it deals with a lot of market volatility. March’s election was not the market positive outcome that most had been hoping for but the red tape of the Italian electoral system has so far wrapped up risk in a tight enough bond to not scare markets yet. Markets are priced for ‘extend and pretend’ in Italian politics and a coalition of intransigence that keeps investors from freaking out for now. We are looking for another election to take place before the year is out with the populist parties likely adding to their totals unless Brussels starts to listen to concerns over fiscal tightness from on high. Further political risk will never act in the euro’s further although another election would not be as bad a result as a government formed of populist parties that may still hold anti-euro agendas. As we open Q2, there is news that French workers are set to go on strike in reaction to plans from the Macron government to try and overhaul the French transport system. The strikes will make headlines but the impact will be muted and wage gains will temper the anger in that greater growth in the Eurozone should allow for unions and businesses to negotiate higher pay without the strikes hurting growth too viciously. If pay numbers continue to run higher in the rest of the Eurozone as they have in Germany and the Netherlands then we will be looking for the euro to also improve. You can keep up to date with all the latest news, commentary and predictions for the dollar by signing up to the free WF morning update delivered to your inbox every weekday morning.